BANGKOK, Aug 28 – Thai immigration police arrested two men, one a Ghanaian and the other from Burundi, for possession of stolen visa stickers at the Thai border in the northeastern province of Nong Khai. Sottle Philemon, 23, from Ghana, and Barutwanayo Eugene, 42, from Burundi, were apprehended three days ago while attempting to pass through the checkpoint in Nong Khai from the Lao PDR. 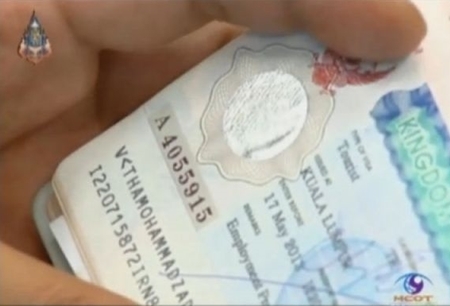 Immigration Bureau commander Pol Lt Gen Panu Kerdlarppol said the stickers, found in the two men’s passports, were issued by the Thai consulate in Savannakhet in the Lao PDR. He explained that the serial numbers 8486222 and 8486223 on the visas were no longer being used, and that the new visa numbers begin with the alphabet letter ‘A’. Police also said the suspected the two men as they should have entered Thailand via Mukdahan, across the Mekong River from Savannaket, where the visas were issued, instead of Nong Khai, which is across the river from Vientiane, the Lao capital. The suspects confessed that they had bought the visa stickers from an agent in Vientiane. The Thai police are collaborating with the Lao authorities for further arrests.